Are dirty gutters detracting from your home’s natural beauty? If so, simply cleaning out the leaves may not be enough. At Renew Crew of Johnson County, we do not pressure wash your gutters to improve the flow – but we do clean the exterior of the gutters to make them look like new. Preserve your home’s curb appeal from top to bottom with our exclusive cleaning and protecting process. Your satisfaction is 100% guaranteed. Why Clean the OUTSIDE of Your Gutters? At Renew Crew, we believe in preserving the aesthetic appeal of your gutters’ exterior. Over time, black strips and stock-on grime can make your gutters look old and worn, thereby hurting your home’s appearance as a whole. 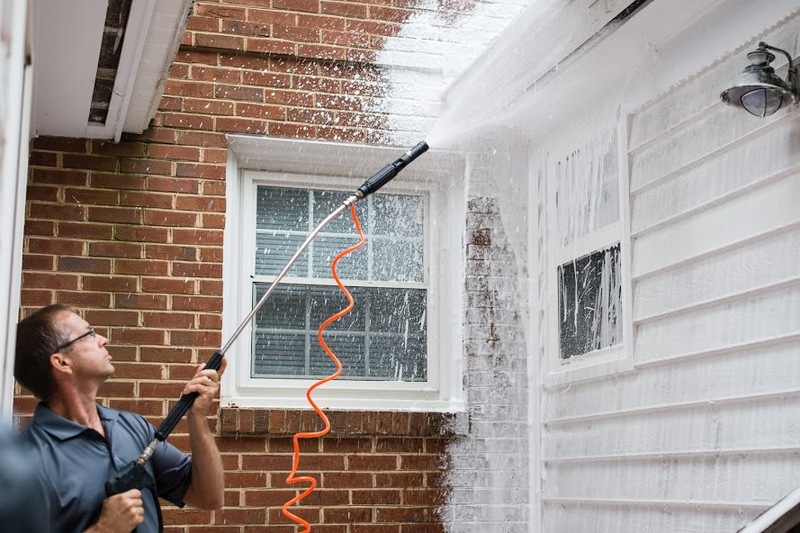 Through a combination of presoak foam, controlled pressure washing, and moisture-repellant sealant, we will restore the look of your gutters and your house at the same time. The benefits of gutter cleaning go far beyond sprucing up your home’s façade. Leaving the dirt and grime untouched on your aluminum gutters can cause it to build up and create ‘tiger stripes’. Since these stripes are not dirt but chemical reactions, simply wiping them away is not possible. Renew Crew’s unique 3-step process will soak your gutters and then gently wash away the stains. Don’t wait until next season to get your gutters looking like new. Call Renew Crew of Johnson County today at 913-661-9663 to schedule a free consultation with one of our exterior-cleaning experts. Be sure to ask about our other services too, like vinyl siding cleaning, hardscape cleaning, deck cleaning, and more. We will come up with a cleaning and protecting plan to fit your home and your budget.